Christmas lists have been created and movies, music and apps for loved ones are now being sourced & downloaded. Business will be booming for digital moguls, but be aware the amended rules give your consumers protection never before bestowed. The Consumer Rights Act 2015, is in place to protect consumers of goods and services provided by the business world. This ensures products and services are fit for purpose, of quality and are safe. It, however, never really addressed downloadable products: songs, movies, programmes and much more that are now available in this new age of technology. Consumers of these technologies and advanced services were often left to buy at their own risk. Not anymore, the new Consumer Rights Act 2015, which came into force in October 2015, updated various part of UK law in relation to consumer contracts to address this imbalance. The pace of recent technological development has caused problems for UK law. Up until the 2015 Act there was legal confusion over how to deal with protecting consumers in relation to digital downloads. There are now express measures in place for digital content bought and downloaded online, and for the updates of that digital content. Review your terms of business, online terms and ensure your insurance and policies mirror and take into account these new rules. Entitlement to damages and compensation if a device has been damaged due to downloaded content is now available under s46. It is extremely important for your terms and conditions to ensure that consumers know clearly what to expect from your product and to ensure you have sufficiently protected your business from any adverse claims. You can exclude liability for damages but note s62 says that there is still a requirement for contract terms and notices to be fair and an unfair term of a consumer contract will not be binding on the consumer. Sales and Negotiations – are your teams setting you up for a fall? Prior to the 2015 Act pre-contractual (sales) information was not automatically incorporated into a contact. Following the 2015 Act pre-contractual information will be scrutinised and potentially will become an express term therefore legally binding. It is important that you are careful in any communications that you have with a consumer and ensure that you closely monitor your sales team who will be in discussions with a customer. The 2015 Act has consolidated The Sale of Goods Act, Unfair Terms in Consumer Contracts Regulations and the Supply of Goods and Services Act. When goods are sold there is now a 30 day ‘cooling off’ period for consumers to reject goods (previously this period was ‘within a reasonable time’). It is important that your returns policy is updated to reflect the current law. Similar to the return of faulty digital content above, there is now a tiered system for dealing with the repair or replacement of faulty goods. 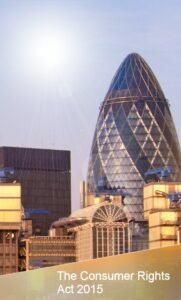 At A City Law Firm our commercial law team is experienced in dealing with consumer contracts and disputes. Share the post "The effect of: Consumer Rights Act 2015"